Model T Ford Forum: So.... Will a TT Ruckstell fit behind my Tiger rear mount transmission? So.... Will a TT Ruckstell fit behind my Tiger rear mount transmission? Model T Ford Forum: Forum 2011: So.... Will a TT Ruckstell fit behind my Tiger rear mount transmission? As the title suggests, I'm wondering if I can put a Ruckstell on my TT, or will my Tiger transmission interfere with it. Now, before you ask why I'd want to do this, as I also have a warford in the truck, I'll tell you. Being able to go really slow is just as novel to me, as going fast in over drive. Plus, who wouldn't want to have more gears than there are days in a month? Here's a couple of picture of the business end of the truck. I don't see why it should be a problem. 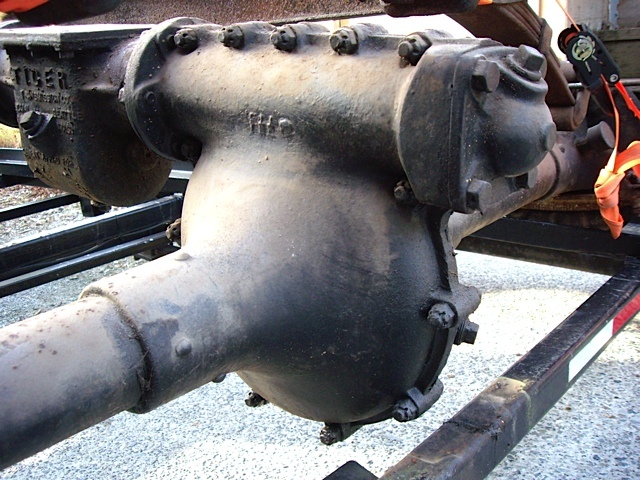 The point of connection between the rear end housing and the drive shaft is the same with or without the Ruckstell. Since the Tiger bolts up to the regular rear end, it should bolt up fine with the 2 speed rear end. The only problem I can think of is the linkage. You might need to do some custom adjustments to one or the other (or both) to get it all to work. Also just my opinion, if I were going to set things up like you want (which I've considered), I'd be sure to have a set of high ratio rear end gears. Heck, with low end gears you could warm it up, put it in low/low/low/low, and find something else to do for a few hours before you could measure movement! One more thing - With or without the Ruckstell and with the 2 auxillary transmissions, in addition to being able to go really slow, you have over/over drive, which enables you to go really fast (for a TT). It's hard to tell from your photos, but it looks like there is some sort of auxillary brake set-up. Be sure it's working well! You have 2 means by which you could get stuck between gears, which would mean no transmission brake at all. Auxillary brakes are a MUST! Yup. At one time I had a TT chassis with a Chicago, a Rocky Mountain (same as your Tiger) and a Ruckstell. I sold it to a guy from California about 15 years ago. It never had an engine so I don't know how slow it would go but it came from a guy who hauled coal from on open pit mine in eastern Montana and he probably needed all of that to get up out of the mine. 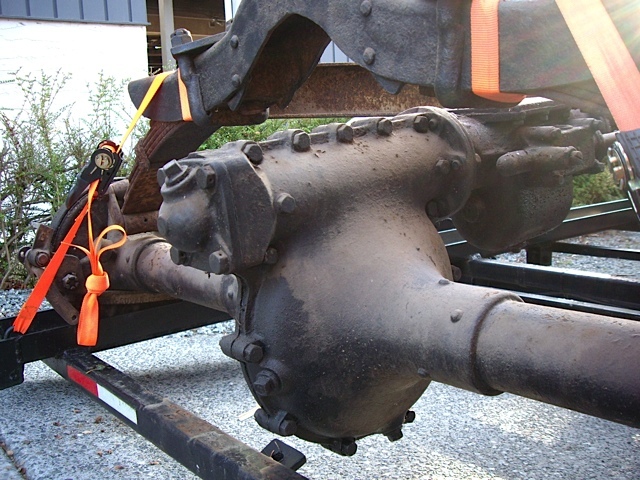 I also had an extended frame for the Chicago and the shortened driveshaft for the Rocky Mountain. I had a similar set up in my TT. Lots of pulling power and nice top speed with two overdrive gears. Problem was you could get them both in neutral if not careful. Rockie Mountain brakes are not just a luxury with this combination...ask me how I know! Oh this is fantastic. The truck has Bennett (sp?) outside brakes on it. Stan, I sent you an email on your Ruckstell site, did you ever get it? Bennett's are what's on my TT. In my opinion you should do everything you can to repair/restore the Bennetts. Unlike other brands, they have a center brake band mounting, which provides equal braking forward or in reverse. Others have an end of band mount and provide really good braking when traveling forward but almost none when backing. Does your truck have a cab or bed? More pictures!! Will there be any over heating problems running that slow. I don't know if it will overheat going so slow, but it's not like I'll be doing that for hours on end. Unless I get to plough some fields! I have a round tube radiator that came with it, if I can, I hope to use it, as I like the way they look, and I already own it. I've posted some pictures before, I'll find the link. I have a metal cowl, but I think I'm going to build a wood cab, I like how square they look. Plus, I'll be able to stick some kerosene running lights on there too. Also, I'm going to build a manual type grain dump bed. Here's a thread I posted which got an underwhelming response! Hahaha. Not sure but a friend had a grain type wood dump box that was all rotted and I think he salvaged all the fittings, want me to check? Don't know what he is doing with it.